While there are many people who snore, you'd probably be hard-pressed to find someone who actually enjoys the fact that they snore. 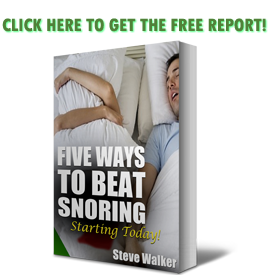 Snoring is not only detrimental to a person's sleep; it can be disastrous to a relationship. Disturbed sleep can lead to unhappy mornings. This can impact the effectiveness of relationships on all levels: professional and personal. For those who are looking to stop snoring, the options up until now have been primarily device-based. Basically, you have snoring mouthpieces like either the ZQuiet or Good Morning Snore Solution, or you’ve got CPAP. If you’ve ever used a CPAP, you probably know that this is not only extremely uncomfortable, it’s also seriously non-portable. If you travel, then, you’re simply out of luck. While these issues may address the snoring and other medical concerns, chances are your sleep isn't going to improve that much. Brought into the country by Luminisce Holistic Innovations, a boutique skin and laser clinic located in Bonifacio Global City, this innovative treatment is non-invasive and patient-friendly, reduces the effects of sleep apnea and decreases the amplitude of snoring by means of a gentle, laser-induced tightening effect caused by the contraction of collagen in the oral mucosa tissue. Unlike traditional treatments, the Fotona NightLase treatment from Luminisce does not require surgery, injections, or devices to be worn during sleep and does not involve chemical treatments. On the average, the procedure will only require 15 minutes – after which a 50 percent reduction in snoring is achieved after a single session. According to London-trained doctor Kristina Cuevas-Reyes of Luminisce Skin & Laser Clinic, three 15-minute sessions done in the course of two months can provide optimum results – as seen not only in improved quality of sleep for the patient but more importantly, a better and healthier relationship. If you've been looking for new options to address your snoring because maybe that snoring mouthpiece just isn't cutting it anymore, you should look into this. While it's going to take a trip to the Philippines to get this treatment, there's nothing wrong with turning a medical appointment into a vacation. Don’t get us wrong: this is a major expense, but because it doesn’t involve actual surgery, instead replacing it with a simple laser-job (much like what plastic surgeons do in the USA) that “shapes the neck”.